It was one of those spur of the moment decisions. Chris and I took off for a leisurely drive intending to have lunch at the Noojee pub followed by an afternoon of shooting at the Noojee trestle bridge and the Toorongo River. 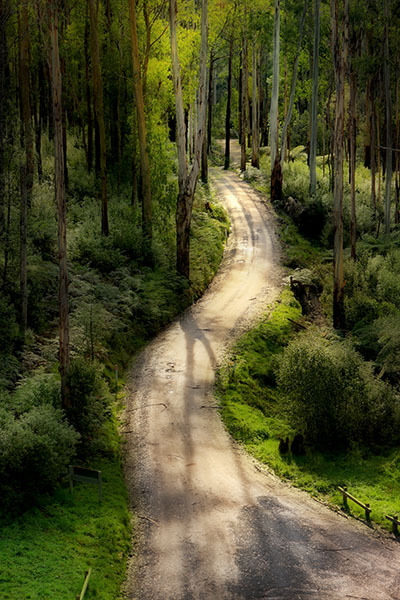 As it turned out things were very quiet in Noojee that Friday. We entered the strangely vacant Noojee hotel dining room and spent a few minutes looking through the menu whilst hoping that they were actually open for business. After a short time we were discovered by a helpful barmaid who ushered us into the bar area whilst explaining to us that the dining room was closed. Pictured below – Dappled sunlight across the middle of the Noojee Trestle Bridge. As we ate our lunch Chris and I would occasionally glance over at the only other occupant of the room. One of the elderly locals was perched at the bar with beer in hand and kept nodding off to sleep. He appeared to be very skilled repeatedly awakening himself just prior to losing balance. Pictured below – A shot taken from the top of the trestle bridge looking down on the access road. I’ve applied an Orton effect filter to this image to soften it a bit. 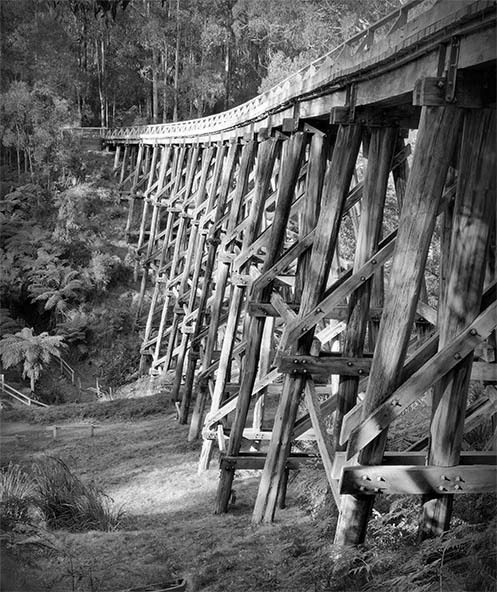 After finishing our delicious meals we visited the nearby Noojee trestle bridge. The light wasn’t particularly friendly that day as the morning clouds had dispersed causing a problem with harsh shadows and bright spots but we did our best. Next stop was the wonderful Toorongo River. I always enjoy the scenic drive along the Toorongo Valley Road that leads to the falls. Pictured below – The Run of the Rain. It’s great to see the river with such a strong flow and healthy green mosses and small ferns growing on the moist rocks again. During this trip I decided to try out the camera built into my phone and capture some images using an Android app called Retro Camera. It uses some interesting processing techniques to imitate old school cameras. A fun app!! 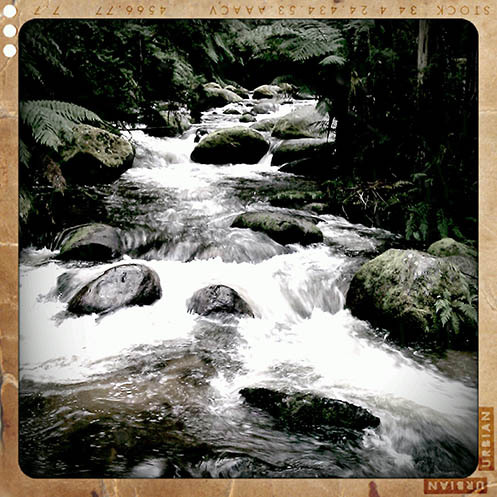 Pictured below – The Retro Camera interpretation of the Toorongo River. 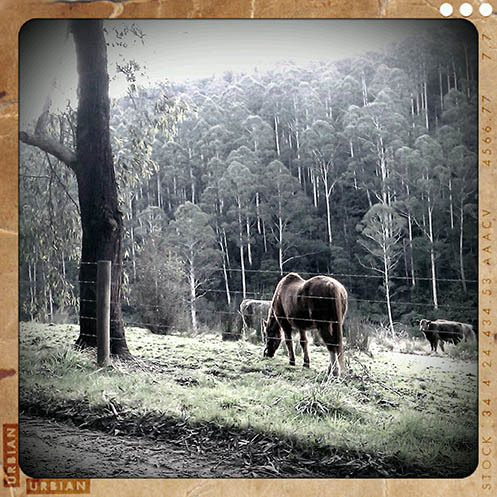 Pictured below – A serene image from along the Toorongo Valley Road processed by the Retro Camera app. 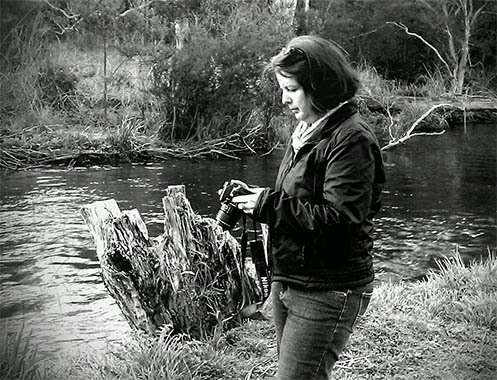 Pictured below – Chris checking her shots on the banks of the river behind the Noojee pub. Image processed by the Retro Camera app. This entry was posted on August 21, 2011 by Jim Worrall. It was filed under art, Australia, Australian, black and white, bush, bush walking, camera, compact camera, green, landscape, landscape photos, long exposure, monochrome, ND400, photo website, photographer, photography, pictures, river and was tagged with art, Australia, Australian, black and white, landscape, long exposure, monochrome, ND400, Noojee, photographer, photography, photos for sale, pictures, Retro Camera app, river, Toorongo. Like your shot of the Trestle Bridge.